The canvas embroidered square needed to be turned into a pillow! Stitched around them together and then edge stitched for faux piping. I added a bunch of stuffing and now I have a happy 16" pillow. 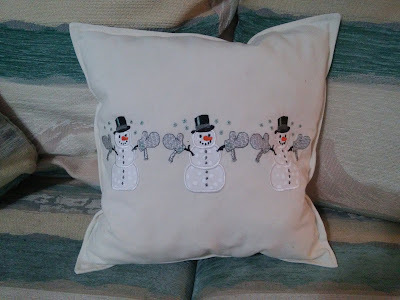 And now I want to make another one so there are two on the couch!!!! 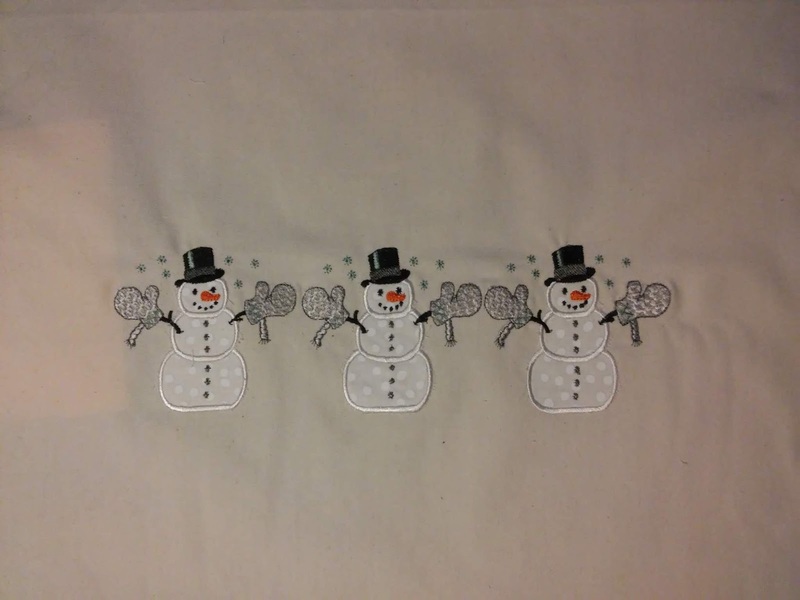 It will be a good way to end the year-snowmen on an 80* day! I have a completed and permanently completed pair of men's socks made on the knitting machine! Since this is the fourth try, I really have nothing to brag about! Especially since I really knit two right socks and not a left and right! it is so invisible, you do not see this little design element! they were supposed to be for my brother-in-law who wears a men's 8 shoe. The socks fit my husband's size 15 feet. Back to the drawing board for the next pair-this yarn is not being ripped back again! 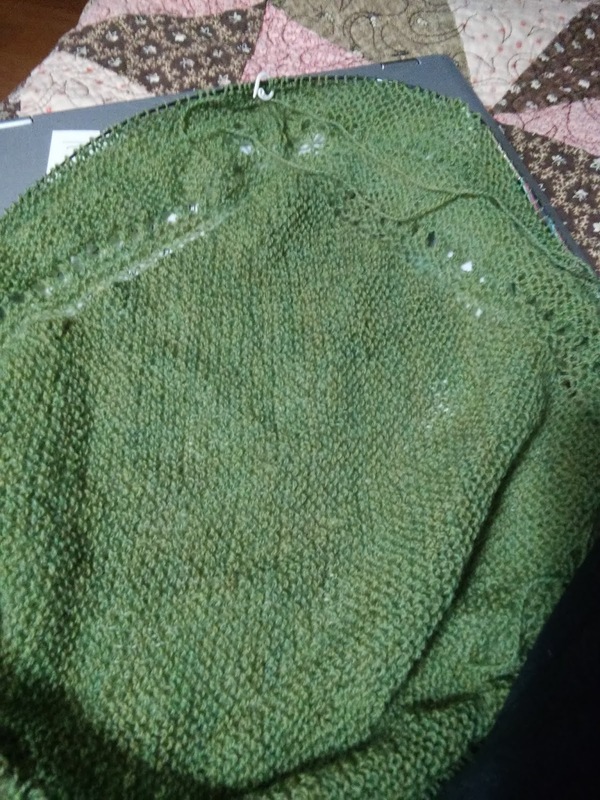 it is written for a sport weight yarn and I was using a lace weight yarn; the sizing was all wrong! I ripped it out and started a different pattern where the yarn size wouldn't matter! 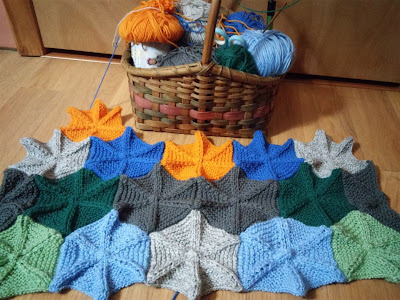 I can just keep going until I run out of yarn! This pattern , Swedish Lines, is one I had bought for my daughter for her first shawl; it was so much fun doing it with her, I thought I would buy it for myself! So I ripped it all out, started again with the next size and this time I will mark where I am each step! Nothing worse than picking up a pattern that had languished and not knowing where you are when you pick it up again! 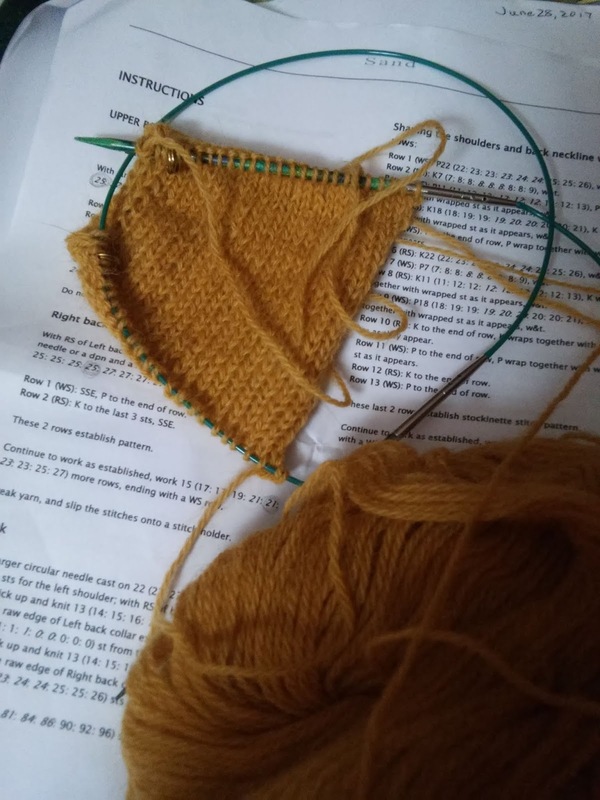 Now I have two patterns going that are interesting and will have a good outcome! What a nice way to knit out the old year! 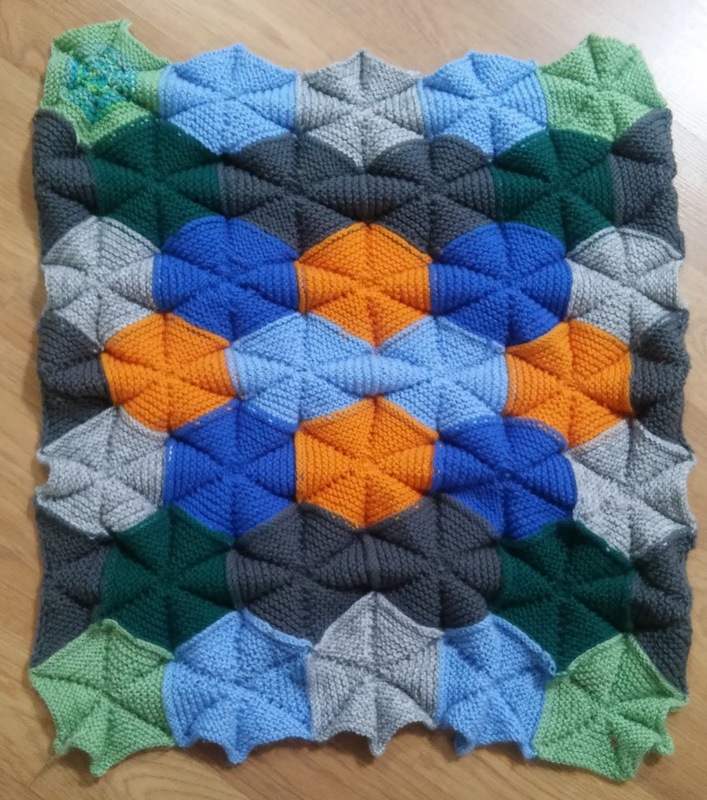 The baby blanket of scrap DK weight yarn is completed! 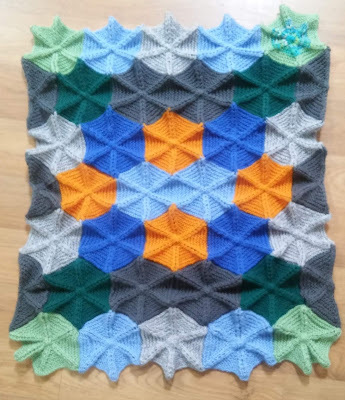 I thought about adding the half hexagons to the bottom and top of the blanket but since it is only optional, I think I will call this done. Nyki had to model her beauty on the blanket! 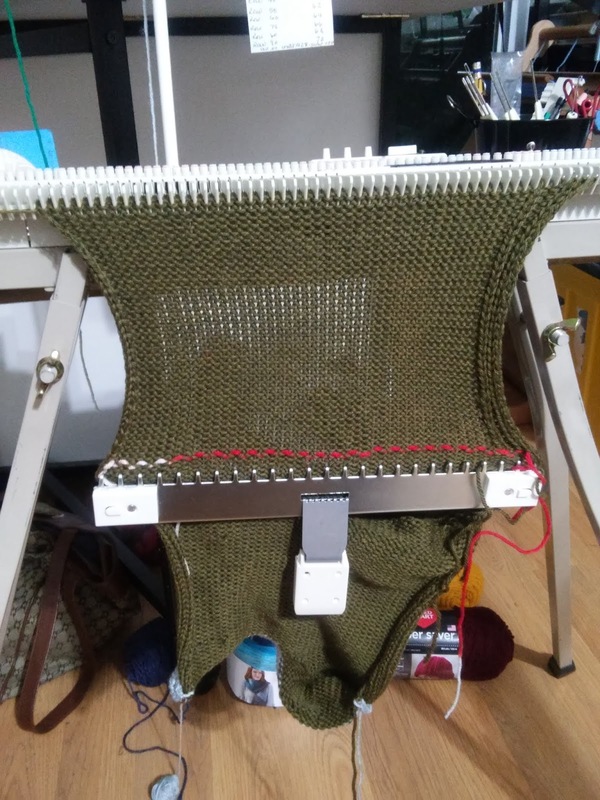 Since I always knit the beginning tail into the first knit row and each of the tails that are cut pull the centers closed and are woven in at the end of each block so when I was done, I was done! I like that it is very neat on the back side too. Once blocked, the blanket has a better shape but I didn't block it too aggressively so there was still some texture left. 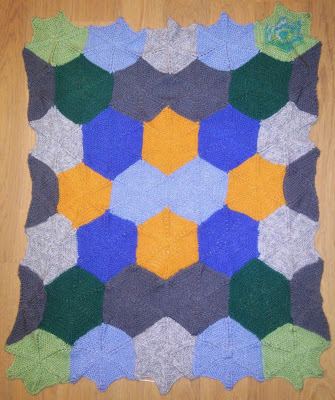 It is now 30" by 36"; just right for a light and airy baby blanket. I did run out of the light green in the top right polygon--I filled it in with a variegated yarn. 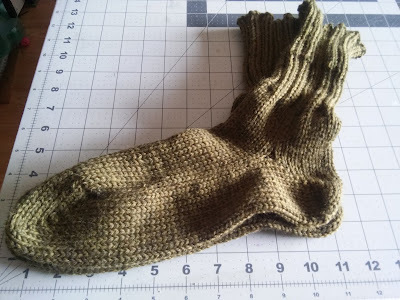 So I finished the second sock and seamed it up and thought-what in the world?!!!! 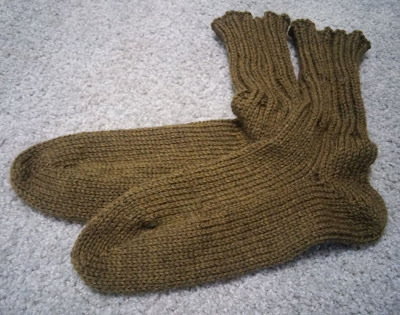 I ripped them out and knit another pair and no kidding--they fit me fine--not big enough at all!!! I will be making another pair--I think I have some math corrections all lined up! Since I have an alone day, I will be up to the challenge! 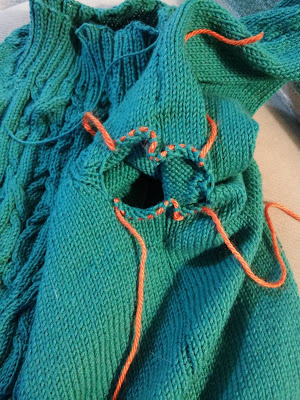 I am so glad that yarn is reusable!!!! and made these applique snowmen on canvas. They will soon be sewn into a couch pillow. 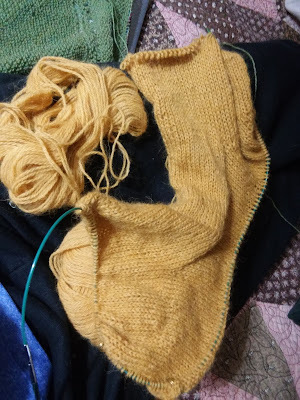 I also played a bit with the second sock on the knitting machine. I almost knew what I was doing each step of the way this time! 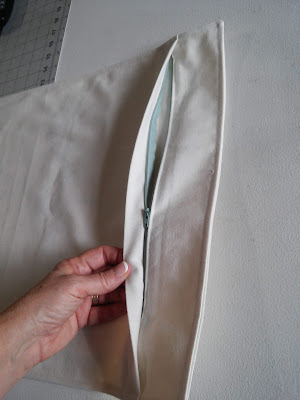 and then seam it up! 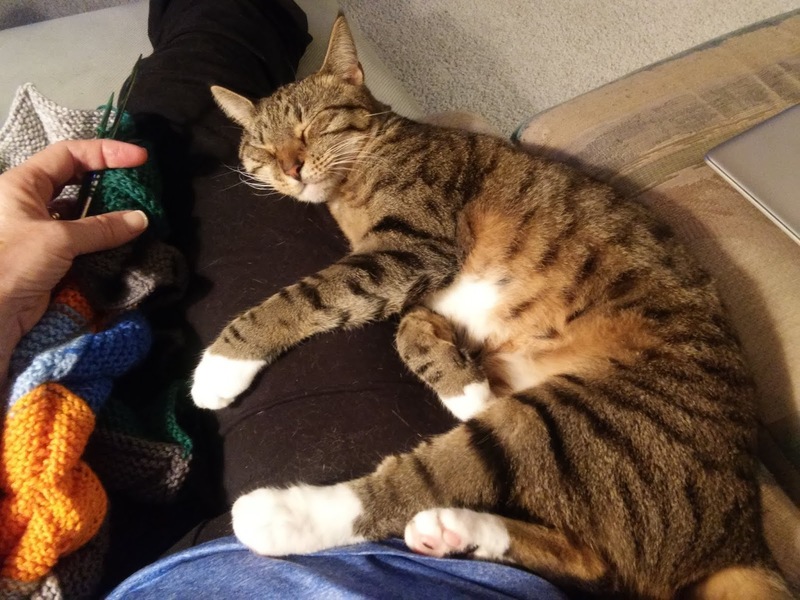 A lovely end of a day finds me with little Lena giving my leg a hug as I knit. She has been with me now 2 years! 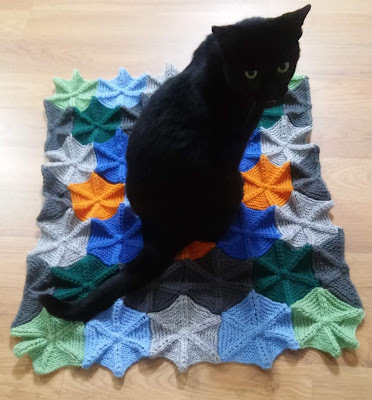 She has been a very sweet shadow throughout this time. 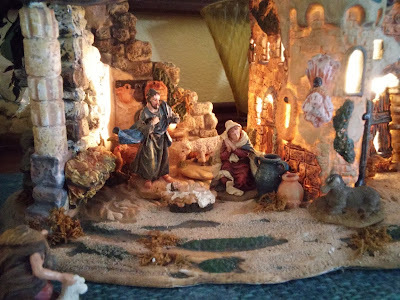 to share the joy the world received when the Savior was born. If there is sadness in your life, sort through your memories to share the good ones with yourself! 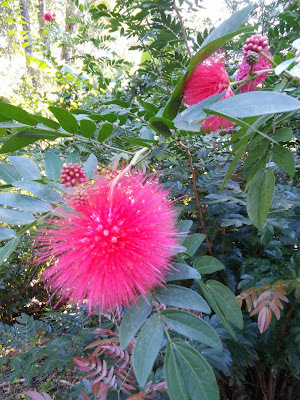 share that with tenderness knowing that there are those that need care. Merry Christmas to all of you reading this! 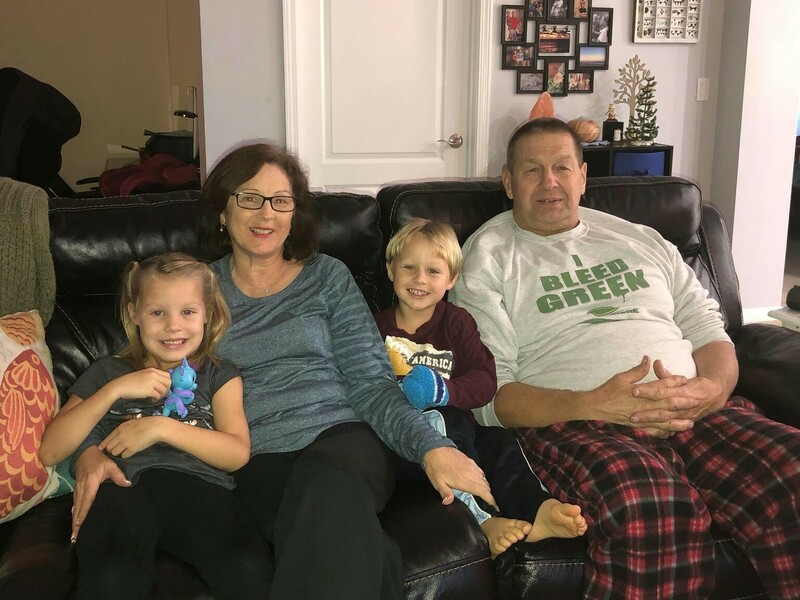 for an early Christmas with them. 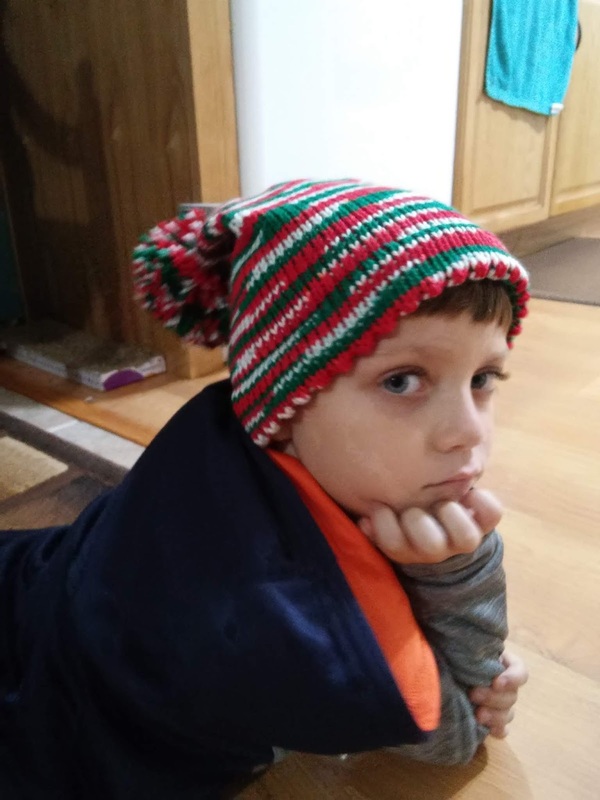 but a real trooper about the pain. Eli loved having us to himself for a change! We played all kinds of three year old games! 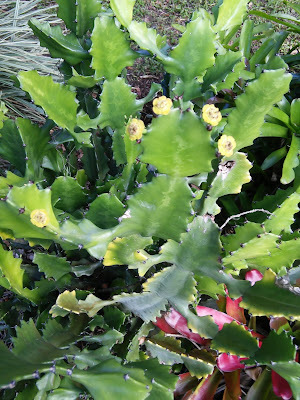 They are waxy thick flowers and there are buds all over the plant! This is a Euphorbia cactus of which there are tons of varieties, a crown of thorns is a more common one. 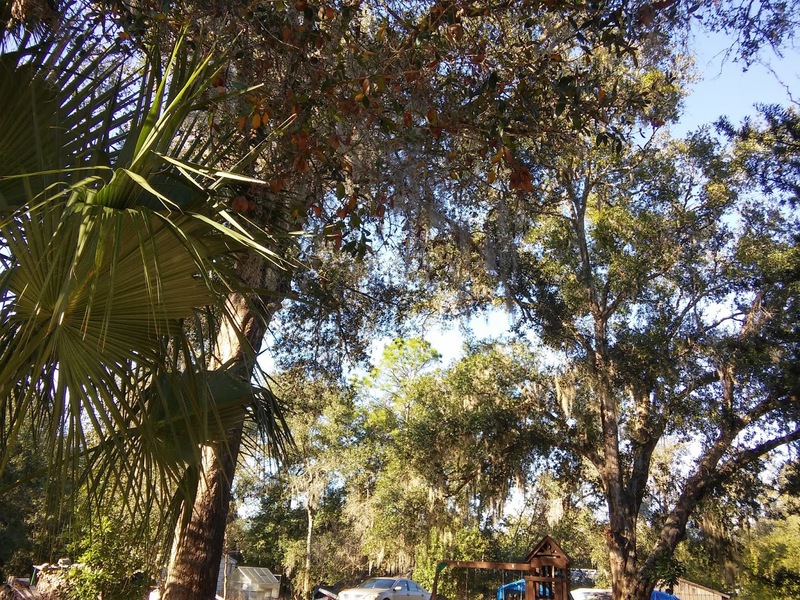 It is cold hardy which is a good thing because we woke up to temperatures in the 30's! 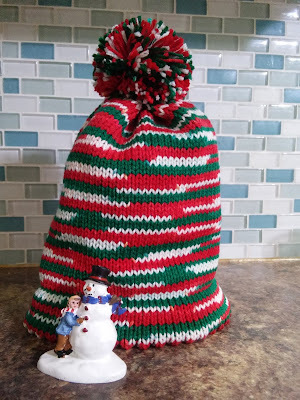 In all the hustle and bustle, I did manage to knit a Christmas slouchy hat to add to the charity pile. 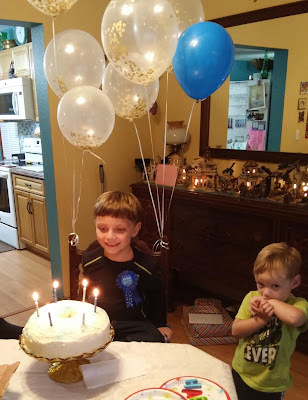 He did a good job with the poses! 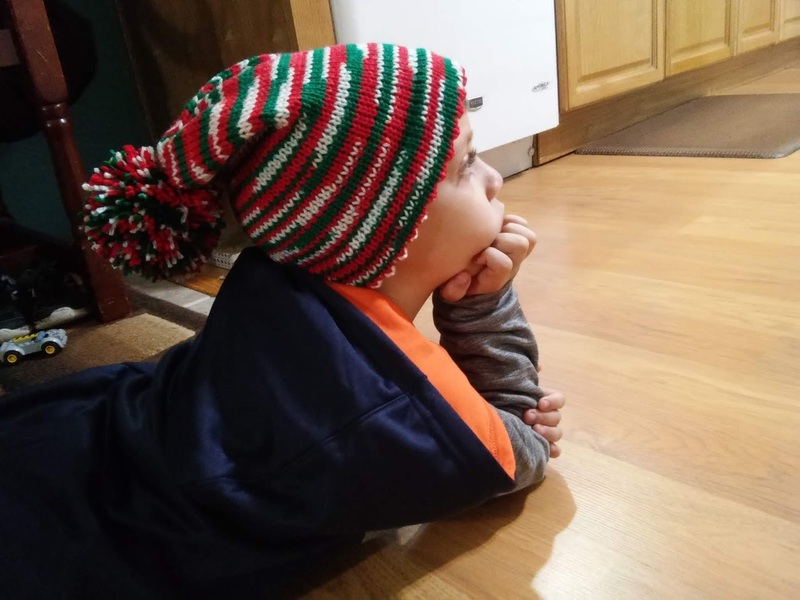 And the hat fit perfectly for my guess at a child 6-8 years old. 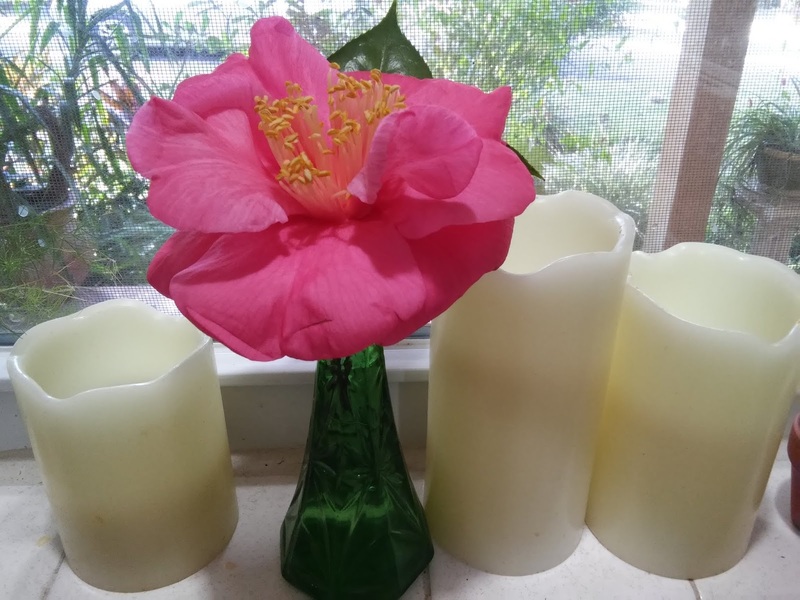 The fancy camellia tree is giving a great show! 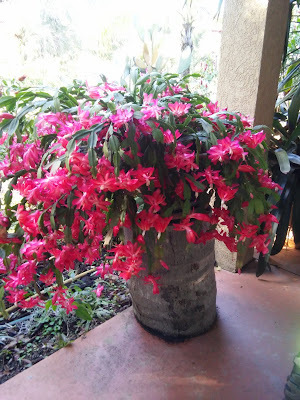 All of my Christmas cactuses are doing this-it is a beautiful showing this year! 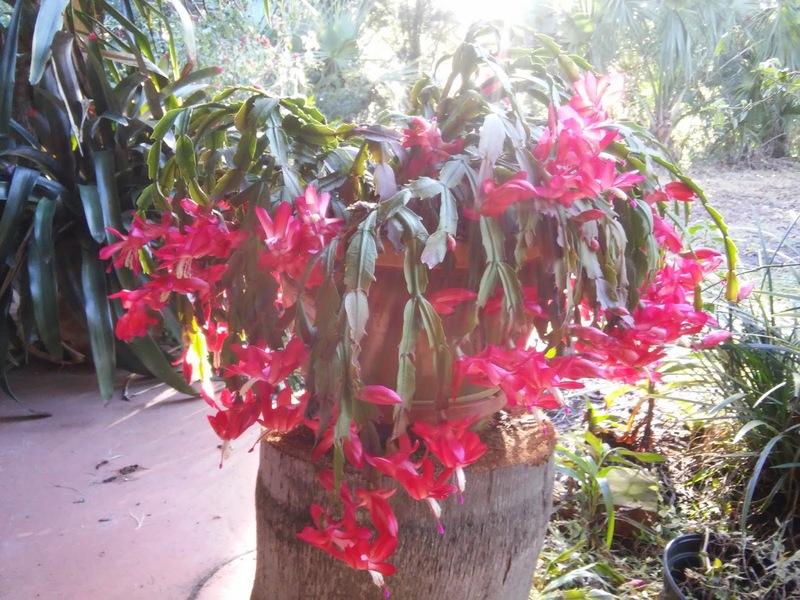 Even this one that was knocked down in the last hurricane and broken off in so many places has made a stunning recovery! 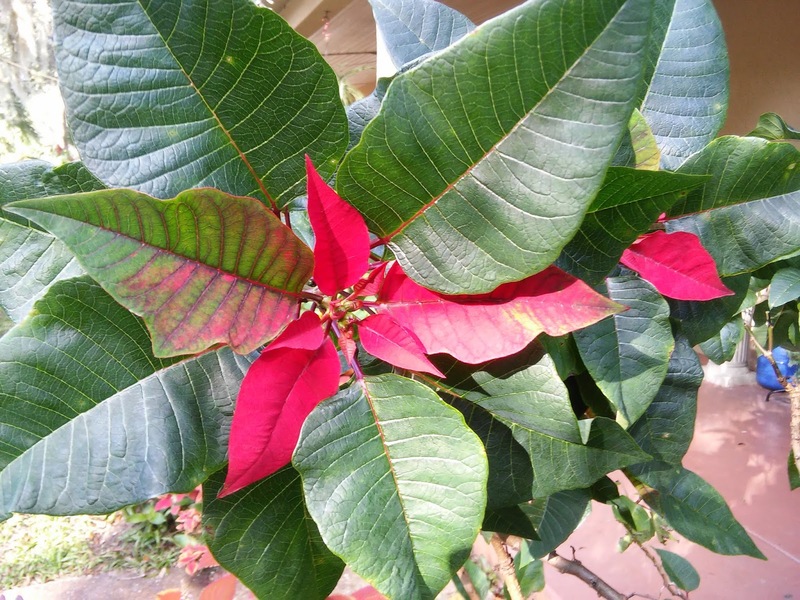 and a sure sign of Christmas-the poinsettia is beginning to redden! I love the red and green --in my house and in my yard! 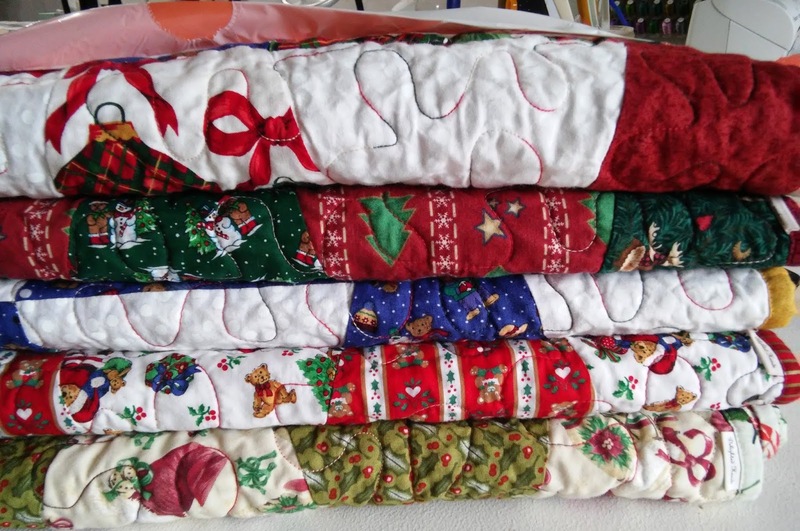 The 5 little Christmas quilts are ready to head to the hospital! 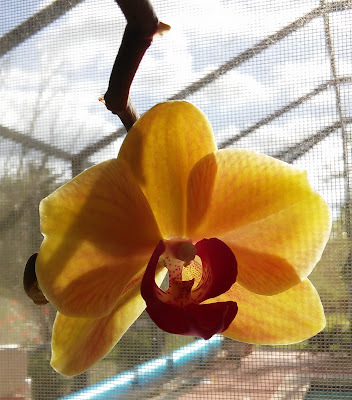 It is nice to achieve a goal! And the knitting project winner is: the Polygon Blanket for my knitting attention for now! So I dug through projects that have languished and looked for one that interested me. I had forgotten the Shhhh! 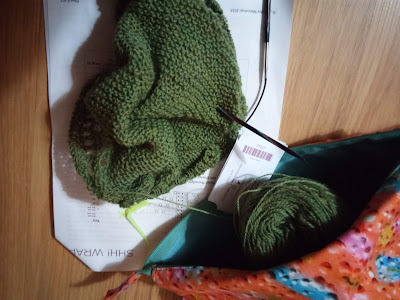 Shawl and it is definitely in the running. but the convoluted top down construction was a misery so far. Maybe I have finished the crazy part and it will be a breeze from now on.....maybe. so this is definitely on the top of the list. Today is my birthday and I hope to work a little bit on each of these projects! and read to a toddler with a cat on my lap! Yes, I think that is a fine way to spend my day! The Helianthus mitts are finished! 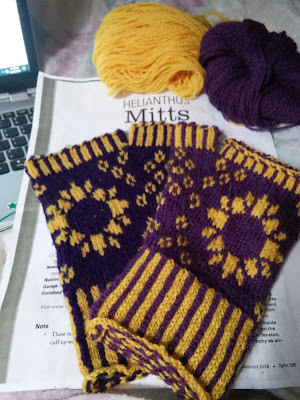 If you remember, I ran out of the darker purple and had to use a lighter shade for the second mitt. I think they are similar enough to pull it off! 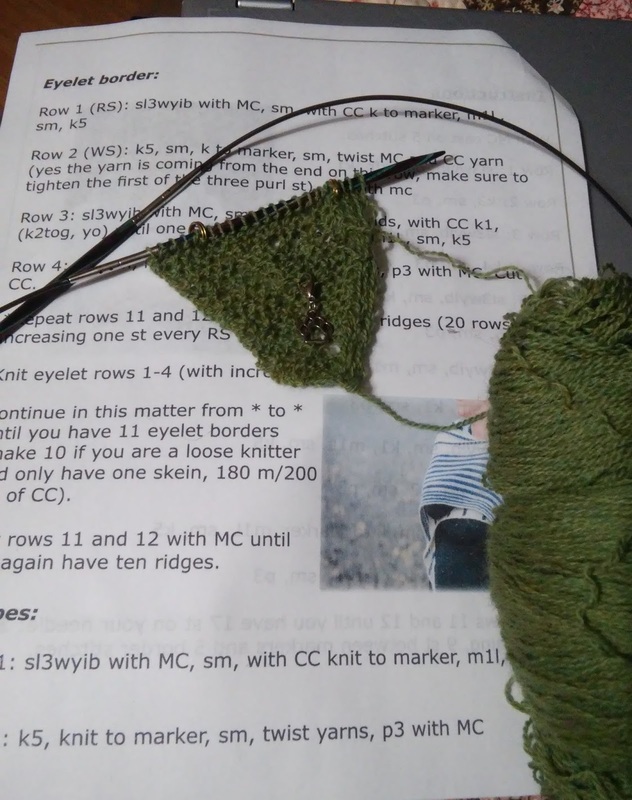 so I sat outside to work on the mitts. 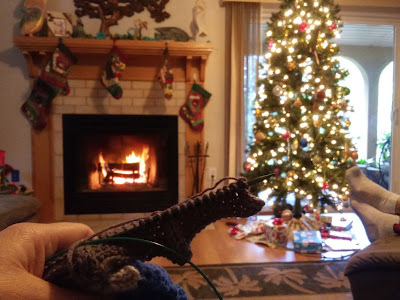 it was a beautiful backdrop for some quiet knitting. I am in between projects. I am not sure what I want to make with it! but I haven't found a pattern to match my mental vision. 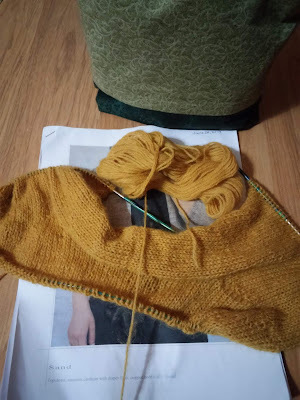 I also hesitate to start in on that project because I usually dig through the started projects from the previous year and either finish them or toss them every January! 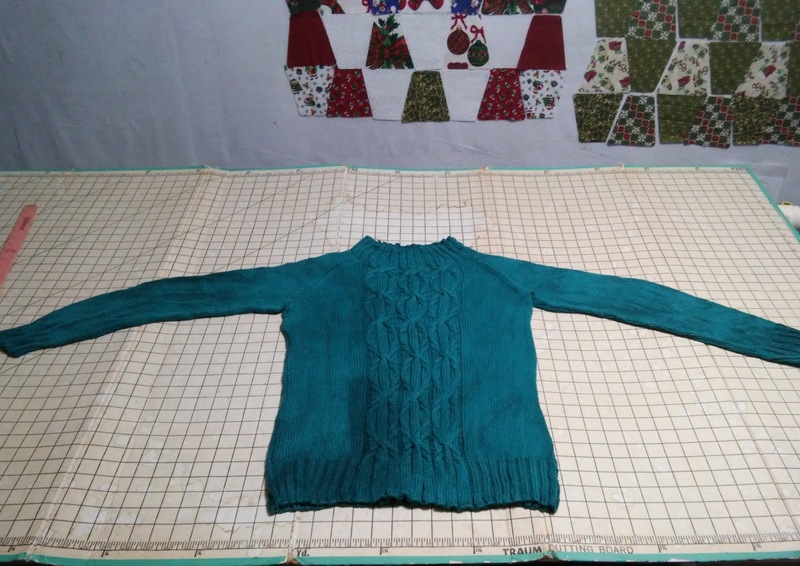 I could start that clean out early and then start the new sweater in January instead. Another day in sunshine of a perfect temperature like that and I will figure it out! to the quilt shop in town to buy some backing for the last two kid's quilts for Christmas. 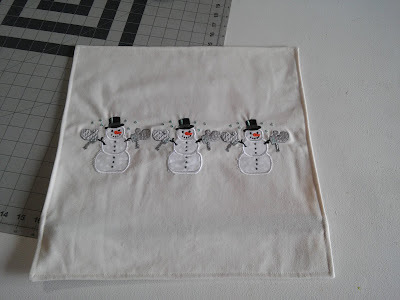 I found the backing with no problem and as usual struck up a conversation with the woman about what I was doing with the fabric and she told me about another lady who was trying to get a lap quilt for everyone at the local nursing home who didn't have a family member and wasn't going to get a present this Christmas. 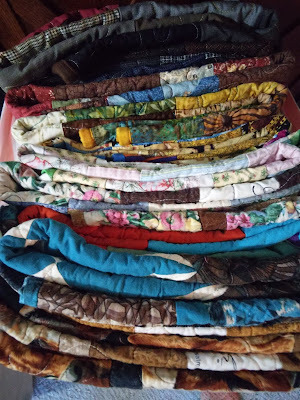 There were 60 such residents and she was working to make one for each of them! 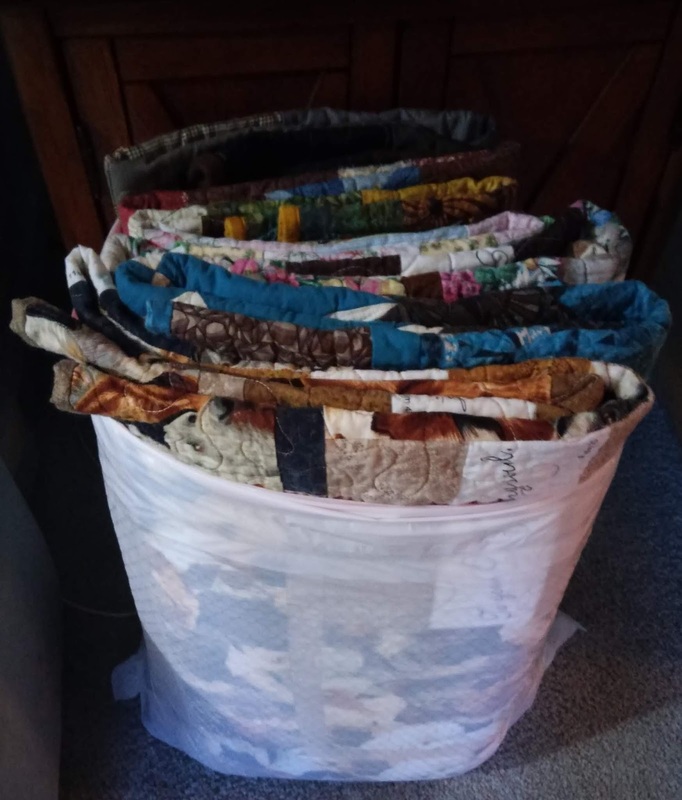 I diverted these from the pile to go to the hospital to her. And we have plans to start earlier this to do something similar for next year! Not quite a Santa's knapsack, but close! You don't have to look very far to find those that need help. 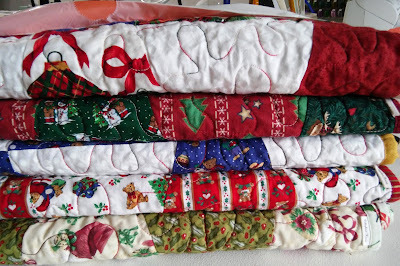 I am still going to give the 5 kids' quilts to the hospital for any Christmas day incidents in the ER! 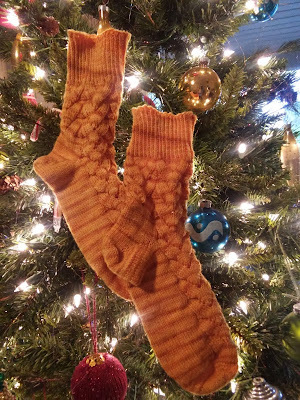 The Cookie A Monkey Socks are finished! I will send them out to their gift giver today! 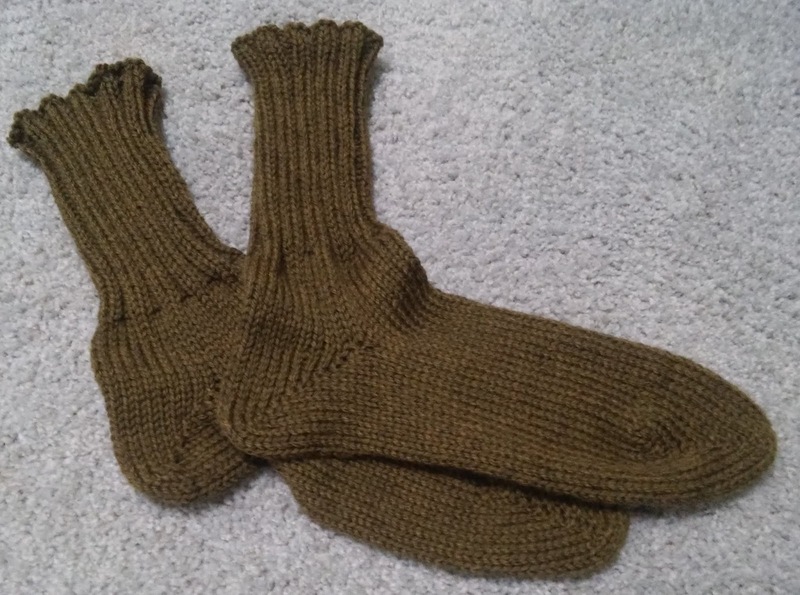 I did knit them toe up with the same chart over 64 stitches on size 1 needles. A delicious blend of lace and gold! And my absence has been due to this teaser (more pics to follow). 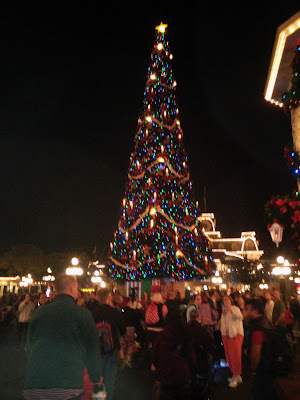 We went to Disney with the boys; it was filled with Christmas decorations and it was magical! The boys have still been under weather; the littlest back to the doctor's again even! I have struggled to participate in my own life....But little by little each night I add a few stitches and finally, the sweater is complete! I reversed the pattern and knit it bottom up, this left a little bit of grafting under the arms is all. 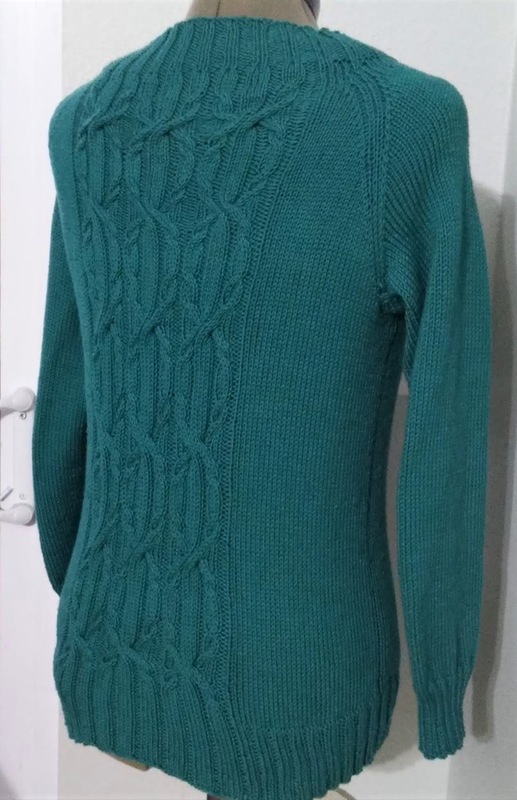 Right to blocking so I can get to wearing it! even though they were made on the machine! 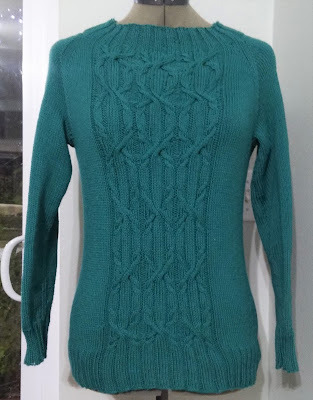 Now what sweater to make? 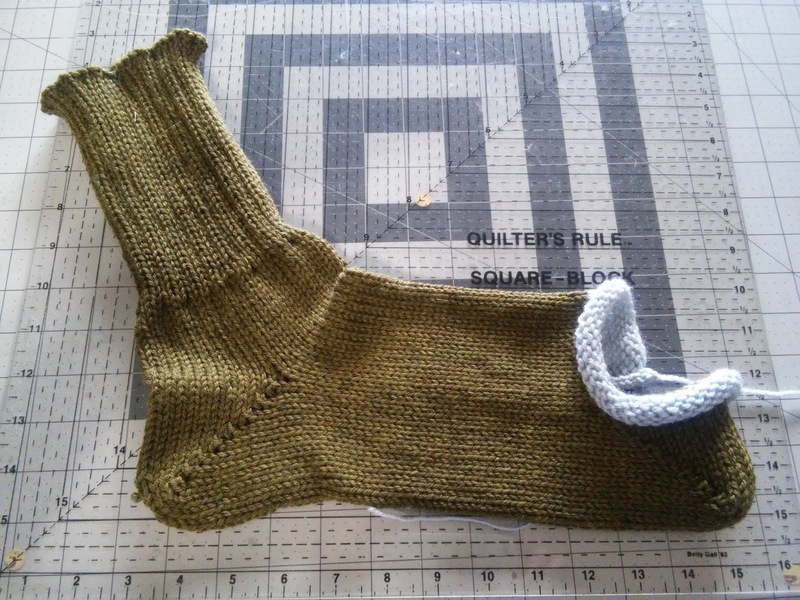 I have some sock yarn purchased for one but no idea of a pattern! 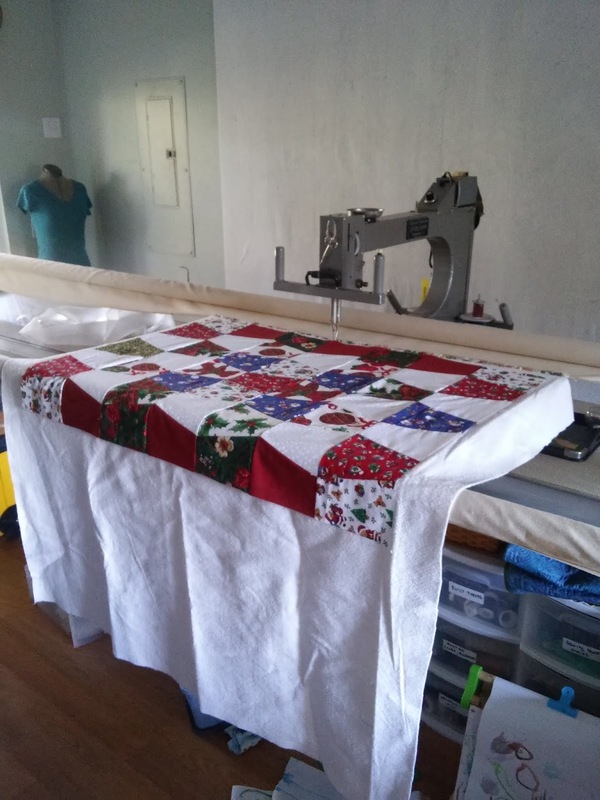 And this is what we did this week! 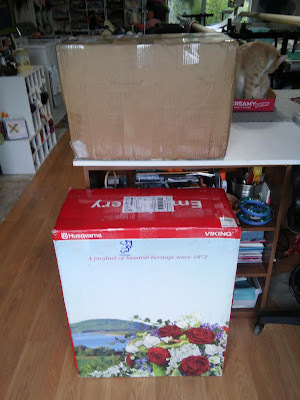 And then I went to the post office to pick this delivery up! 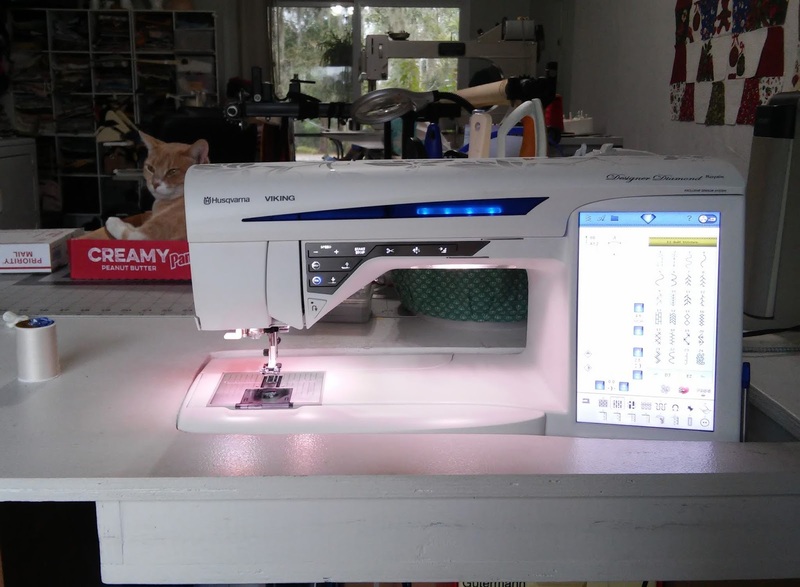 I turned to EBAY to replace my sewing machine that died. I bought a Designer Diamond Royale; all the bells and whistles for the seamstress, quilter and machine embroiderer! 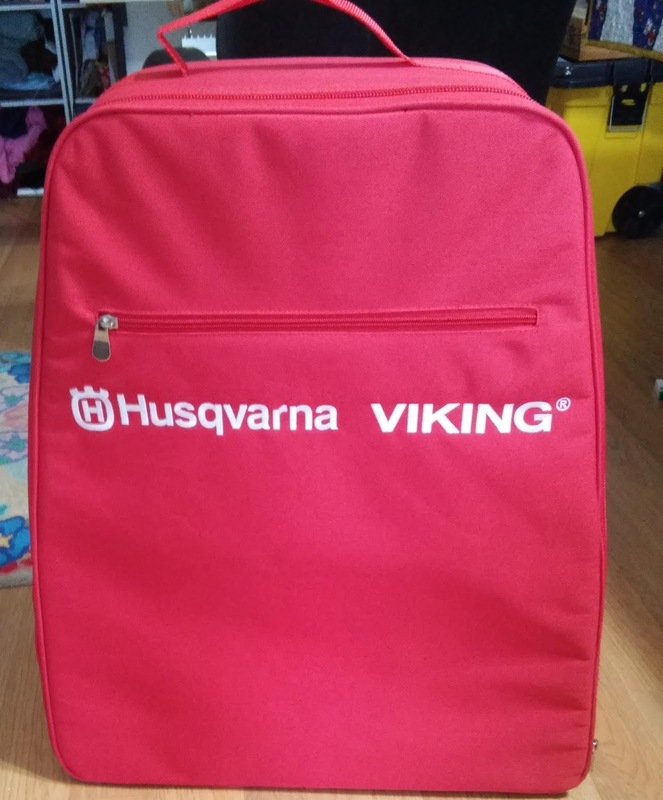 The embroidery part of the machine is stored in this fancy case! I immediately ran it through its paces and we are friends already! 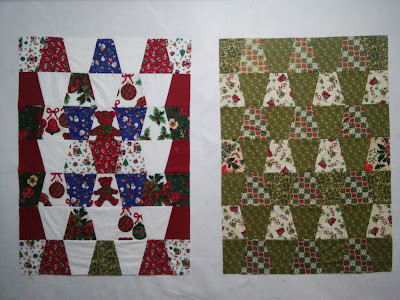 I had the two textra Christmas quilt tops pieced in no time!